I’m (hopefully) creating a term: “startup project”. A startup project is a project done on the side, not setting up a company, with or without partners, with the intention of one day becoming a startup. I don’t have a startup, but I have many startup projects. Many silly little ideas with great aspirations. I need a term to separate that from non-startup project (like writing free software or build a house for the dog). Keep on Posting: sends you a reminder when you haven’t posted in your blog or twitter account as often as you used to. Ideal for people that forget about their blogs (like me) or are running blogs for several products, departments, etc. DNSk9: constantly checks your DNS and sends you reports when something goes wrong. .gitignore and .hgignore: database of information for .gitignore and .hgignore files; currently gathering data and it will become an application if there’s enough of it (I doubt it). RadioControlPedia: gather and publish all the information related to radio control; maybe some day becoming the gdgt of radio control. Hear a Blog: convert blog posts to audio with an actual person’s voice, so you can hear your favorite blogs while you are commuting, jogging, or on the go. Many of them are dead or inactive. With .gitignore and .hgignore I believe I’m already getting as many visits as I possible can and it’s not that many (understandably, it’s extremely nichy). RadioControlPedia is there, providing the information it has and open to anyone to contribute. I have some plans for it in the future but for now, I’m putting my time in other ideas. I really want to stay away from content for now. Restraq and Hear a Blog deserve posts of their own, so wait for it. Meanwhile, what do you think about the term “startup project”? 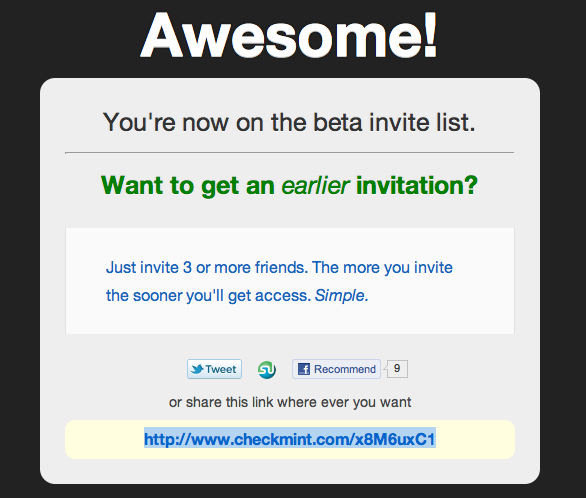 That is brilliant, great move to get people to invite more people to try an application that doesn’t even exist yet.